Because she wanted to know why I never talk to her or more particularly why she never hears from me or Evie and what had she done to deserve to have such silent sisters. The following is some reparation for my neglect, I hope. I am being “efficient” and posting it in a blog as well, albeit slightly revised for privacy purposes. My life is mostly keeping home for Elv, me and the children that still hang around here most of the time. I still don’t like to cook. I had this neat idea that I would pretend I have a cook who WANTS to do the cooking. And we would sit down, she and I, and find recipes and menus together. Then I would make a grocery list for her and send her shopping and each day I would sit with her and tell her what kind of meal our family wishes to enjoy in the evening including the table setting and decorations. I would order up anything I wished to enjoy. Then I would turn around and tell me I am she…so get on it now. I thought maybe it would help all the blahs I am enduring with wheatless food and meals. Besides the meal battle there’s homeschool hours. I have two of them in school and the three of us have fun, bookish discussion every day on all sorts of subjects from hydrogen atoms to adjective phrases. And we’re reading Ben-Hur for story time. There’s the home management part of my life. I have been going to paint the ceilings for years. They’re still not painted. Maybe next spring now after we’re done firing the stoves. I noticed yesterday that I need to dust my bedroom and sitting rooms badly. Several months ago I thinned out a whole bunch of books that didn’t mean anything to me and gave them to Salvation Army and the big old bookcase to Charlotte. That makes more room in my house. Then I took Grandpa Skrivseth’s old bookcase to the cabin where it fits perfectly under the windows in the front room upstairs and holds lots of books. Each time we go up we take a few more. Yesterday, I stopped at the SA store to look for a big heavy covered soup kettle. 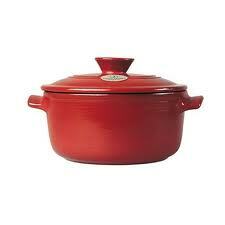 I envision a red pot wherein you can cook up two gallons of soup and serve the army. Is there such a thing?Something like this. What I did find was a blue teapot and a bluer coffee carafe for the cabin. And there was an ugly wall sconce with a candle inside a lamp chimney for a dollar. I wanted only the lamp chimney, the rest can go in file 13 for all I care. Lamp chimneys seem to cost about six dollars a piece around here. I have 14 lamps at the cabin and three more that need chimneys so I always am on the lookout for such things. We have been feeding a few armies lately because we have been helping our friends move their business out of town to home and it is a huge undertaking. I can’t really lift or scrub much but I can cook and play hostess and innkeeper. I’ll be doing that again Friday and Saturday up at the cabin near to where our friends are working. Thankfully, I have had lots of good help from other friends in preparing and serving food. That cook thing. I felt the exact same way last night. I have found that cooking is more fun when I think of it as an art rather than a chore…. Cooking isn't my favorite thing to do either. I'M the cook. I need a dishwasher! 🙂 I have a wonderful cast iron kettle that I roast my chuck roasts in and make my chili soup in. But it's missing a lid. So when you're out doing the Salvation Army stores…keep an eye out for that lid of mine will you?